Surprise happy news time: DONTNOD are making an all new Life is Strange. Life is Strangerer? 2 Life 2 Strange? I'll... stop there. There's no information on what the new thing will be yet, only that it's "a brand new Life is Strange game" and the original team are working on it. I think it's interesting they didn't mention a new season, or episodes at all. Might it be a full, all-in-one game rather than episodic? Here's the official announcement video, which is mainly three of the team being really happy everyone liked the game, then casually mentioning a new one's on the way. "If you’re reading this, you’ve likely already heard or watched the news… we reached over 3 million unique paying players! It’s an incredible achievement and one we could not have reached without you, our fantastic community! You helped spread positive words about our game and have continually kept the world interested in what happens next. 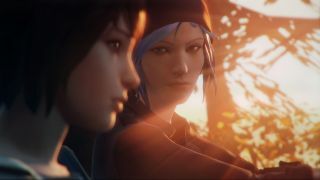 We also revealed a key piece of information that many of you have been waiting some time for now - we can indeed confirm that the original Life is Strange team at DONTNOD are working on a brand new Life is Strange game. We can’t wait to tell you all about it when the time is right, but for now we are hard at work ensuring it is the very best game we can create. We’re really thankful for your patience thus far and ask for a bit more time. The new game will not be at E3 in June this year but we will be watching the show alongside you all and wish everyone good luck!" You can check out our original Life is Strange review here, or maybe check out DONTNOD's less life affirming game, Vampyr.